Over the past few weeks I have been making a trek to the foothills east of Fresno about half-way to Kings Canyon National Park in an effort to catch an image of the Valley below in splendid evening light. The idea comes from a local photographer, Paul Mullins, who has a wonderful image made there called "Saddleback Sunset." See http://www.paulmullinsphoto.com/san-joaquin-river/ for Mr. Mullins take on the area. But, as often happens, I spied this area on the drive there and watched it develop for the better over a couple of weeks. Some photographers believe that we have missed the point if we simply re-shoot other successful images. But I have found that some of my best photos were made "while I was on the way" to re-shoot someone else' shot. It gives me a reason to set out in that direction in the first place. If nothing presents itself on the drive there, then I can always do the re-shoot. On my last run to the foothills before giving up on that shot for the year, I saw that this scene was ready. So I gave it a go for a couple minutes in evening light and realized that morning light would likely be better. 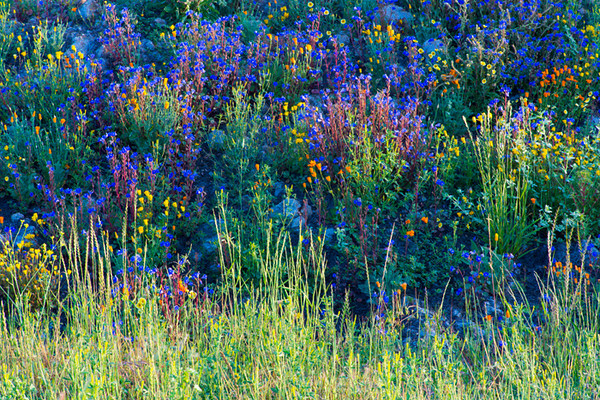 This is just a group of wildflowers along the roadside likely seeded by CalTrans upon completion of an upgrade to the roadway nearby. The flowers are growing on an embankment making for a wonderful perspective. Works for me. Love the blues here. They appear to be Blue Flax; the blue flowers have 5 petals & 5 stamens. No filters were used in this shot. Taken with Canon's 24-105 f4 lens with 1.4 tele-converter attached.